Miriam Makeba, a Grammy Award–winning South African singer, rose to fame in the hearts of her people at the pinnacle of apartheid—a brutal system of segregation similar to American Jim Crow laws. Mama Africa, as they called her, raised her voice to help combat these injustices at jazz clubs in Johannesburg; in exile, at a rally beside Dr. Martin Luther King, Jr.; and before the United Nations. Set defiantly in the present tense, this biography offers readers an intimate view of Makeba’s fight for equality. Kathryn Erskine’s call-and-response style text and Charly Palmer’s bold illustrations come together in a raw, riveting duet of protest song and praise poem. A testament to how a single voice helped to shake up the world—and can continue to do so. Kathryn Erskine is the National Book Award–winning author of Mockingbird. She has also written Seeing Red, The Absolute Value of Mike, and The Badger Knight. She lived in South Africa for part of her childhood, and grew up listening to Miriam Makeba's songs. Mama Africa! is her first picture book. Charly Palmer is a graphic designer, illustrator, and fine artist. As a child, he was fascinated by Ezra Jack Keats’s illustrations for The Snowy Day, which inspired Charly’s own use of color and geometric shapes. He studied art and design at the American Academy of Art and the School of the Art Institute, both in Chicago. 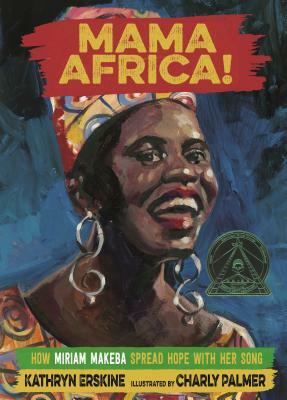 Mama Africa! is his first picture book. One of Kirkus's Best Books of 2017!